Product code: ES7933 Categories: Sold Items, Sold Watches. Watches and jewellery of the 1950’s has become so popular in recent years thanks in part to the fabulous bold designs that were often found, and can be seen here in this amazing 18ct rose gold diamond Retro era watch from the 1950’s. 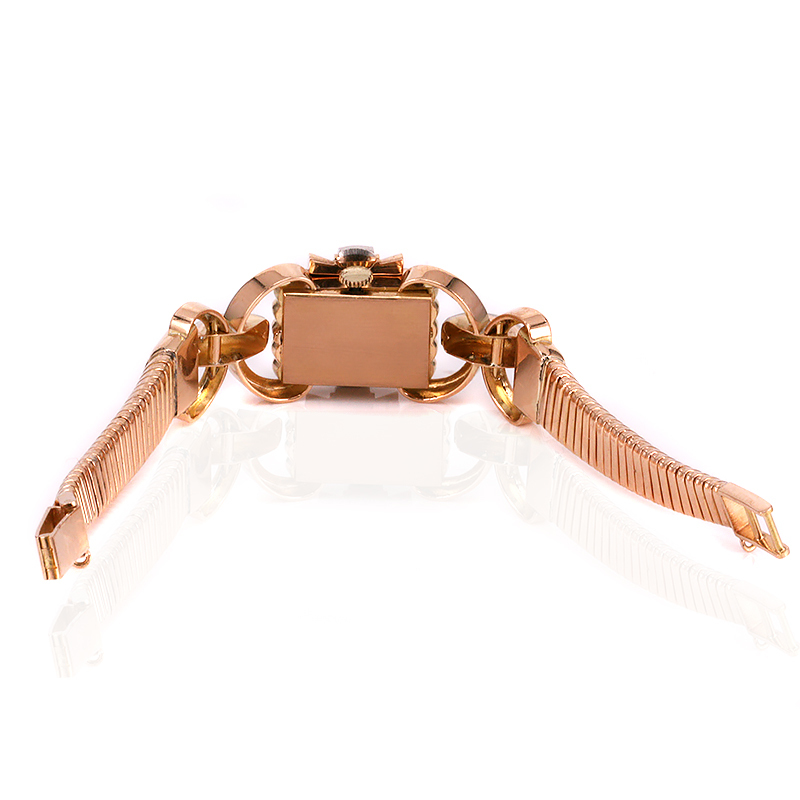 Made in 18ct rose gold, this is a bracelet as much as a watch as there is not only six European cut diamonds set on the case, but an additional five European cut diamonds on the hinge. These diamonds all come together to total 0.98 carats and sparkle magnificently. The way this front cover opens to reveal the dial makes this such a talking point and conversation starter. With an incredibly sculptured case, it is fitted onto a tubogas link band which is arguably one of the hardest and most difficult links to make let alone find on a watch. With an incredibly tactile feel to it that wraps beautifully around the wrist, from end to end the watch measures 18cm in length. Inside is a 17 jewelled manual wind movement that has just been recently serviced and comes complete with our twelve month warranty. This is a fabulous diamond watch from the Retro period, and one that will always be admired.